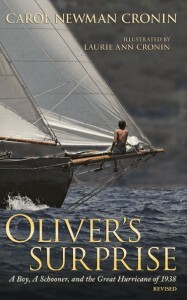 Home »Books»Second Edition of Oliver’s Surprise… IT’S HERE! The new edition is beautiful. I thought the first edition was nice.. and it was, according to all of you who bought it and devoured it. But this version adds a history of coasting schooners, for the education and enjoyment of all and to help out the many the teachers who want to bring the book into their classrooms. The added section increases the heft of the book, making it physically more satisfying to hold. And thanks to the input from publisher GemmaMedia, we also did a few tweaks to the cover that make it even nicer. It’s also satisfying to see the list of “blurbs” we received. Notable author James L. Nelson says the book “is about as much fun as you can have without actually being on a boat!” What a treat to open it and find “praise pages” inside. Thanks to the publisher, it’s one very professional package.